Cameron Bancroft and Steven Smith’s actions in the Cape Town Test against South Africa have received worldwide condemnation. Rightly so, considering the seriousness of what they’ve done and how it’s brought both the sport and Australia into disrepute. Here, I’ve produced a guide which clearly explains exactly what they’ve done and how they’ve contravened the laws of the game. Under Law 41.3.2, it is an offence for any player to take any action which changes the condition of the ball. The only thing that players can do to a cricket ball is polish it without the use of an artificial substance, dry it with a towel or remove mud under umpire supervision. Any other action is illegal. How do you tamper with the ball? Ball tampering is not new and there have been plenty of ways of subverting the law in a hope to gain an advantage. The more innocuous ways include using saliva or sweat to polish one side of the ball, or by throwing it to the wicketkeeper when fielding, in an attempt to scuff up one side of the ball. More blatant attempts include picking at the seam or surface with a fingernail, using foreign objects to scratch it or standing on the ball. The aim is to help the ball swing more in the air, which when bowled at over 80mph, can make life significantly harder for a batsman. In Australia’s case, inexperienced opening batsman Cameron Bancroft attempted to change the condition of the ball, and in so doing, breached Law 41.3. He admitted to taking some sticky tape from the dressing room and sticking dust granules from the pitch on it in order to develop an abrasive surface which when used on the ball, would help it reverse swing. The act was pre-meditated, with captain Steve Smith and the “leadership group” discussing it during the break. As a result, Bancroft has been fined 75% of his match fee and handed three demerit points by the ICC. 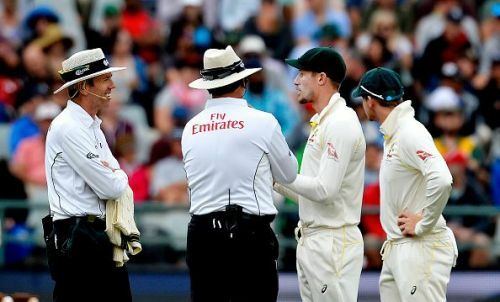 Smith was stood down as captain for the rest of the Test, along with vice-captain David Warner, and handed a one-match suspension by the ICC and fined his entire match fee. He’s also stepped down as captain of Rajasthan Royals for the upcoming IPL. Who else is in the leadership group? There was no explanation regarding the individuals in the leadership group, but Smith, Warner and other senior players, like Mitchell Starc and Josh Hazlewood were part of the decision-making process. Tim Paine seems innocent, as his promotion to interim captain would suggest, while coach Darren Lehmann, who Smith has suggested wasn’t involved, could also be a part of it. Is this a good alibi? It all works out apart from one tiny bit. Lehmann was caught speaking to 12th man Peter Handscomb prior to Bancroft being caught on camera. Handscomb then spoke to Bancroft, who hid the tape down his trousers. There’s no doubt that this bit will require some explanation. Do they deserve credit for facing the media? No. In any line of work, most people are required to accept some form of responsibility when something goes wrong. On top of that, they initially denied it by trying to mislead the on-field umpires. Only when the television images were produced were they required to face the media and answer their questions. And even then, they weren’t particularly good answers. Apart from this, have they done anything else wrong? Under Lehmann, Australia’s behaviour has been horrendous, and this is the latest in a long list of indiscretions. There’s been a history of sledging in Australian cricket, but they’ve overstepped the mark recently, both in this series and the Ashes. Thoughts date back to the 2013/14 Ashes series when captain Michael Clarke told England player James Anderson to expect a broken arm. There have been no previous ball tampering incidents under Smith’s captaincy, with himself even describing this as a first-time offence. However, this will be met with scepticism as Australia were getting the ball to massively reverse swing in the Ashes series. No doubt there’ll be some footage poured over to check. Are Australia the worst offenders? No. There have been incidents of ball tampering dating back to the early 1990s. Former England captain Michael Atherton was fined £2,000 for applying dirt to a ball in 1994. Under Inzamam-Ul-Haq, Pakistan refused to return to the field of play after being accused by Darryl Hair in a Test match against England in 2006 and subsequently forfeited the game. Faf du Plessis has been found guilty of tampering twice, while Vernon Philander was also guilty of a minor offence related to affecting the condition of the ball. Altering the ball condition is deemed to be a Level Two offence, two lower than the most serious offences. The sanctions include three or four demerit points added to the culprit’s record. Four demerit points equal a one-Test ban, while there are also deductions in match fees. However, after this recent incident, there have been calls for the punishments to be revisited and increased.